Stoves, Iron kettles, Copper, Brass, do. 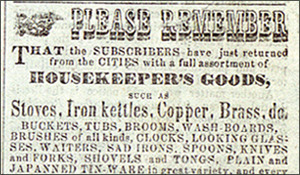 BUCKETS, TUBS, BROOMS, WASH-BOARDS, BRUSHES of all kinds, CLOCKS, LOOKING GLASSES, WAITERS, SAD IRONS. SPOONS, KNIVES and FORKS, SHOVELS and TONGS, PLAIN and JAPANNED TIN-WARE in great variety, and every article usually kept in a well-regulated establishment of the kind. Persons going to HOUSEKEEPING will find a good assortment, LOWER than can be purchased elsewhere.